In accordance with the plan it announced in June 2017, the Federal Reserve has begun reducing its $4.2 trillion holdings of Treasury securities, agency debt, and mortgage-backed securities. The potential impact of these asset reductions on long-term interest rates has been the subject of extensive debate. As it sells off assets, the Fed also will be cutting its liabilities, primarily by reducing its supply of reserve balances. This brief focuses on the liquidity effect of draining the reserves. Specifically, it looks at how this reduction could affect short-term interest rates. Estimates indicate that a reduction in reserves of $100 billion will increase the effective federal funds spread by 0.5 basis points and the overnight repurchase agreement (repo) spread by 2.1 basis points. Assuming the reduction in securities holdings is related one-to-one to a drain in reserves, estimates indicate that because of the liquidity effect, by January 2019, when the Fed will have reduced its portfolio by $500 billion, the repo spread will be 10 basis points greater and the fed funds spread will be 2 basis points greater than in October 2017, all else being equal. 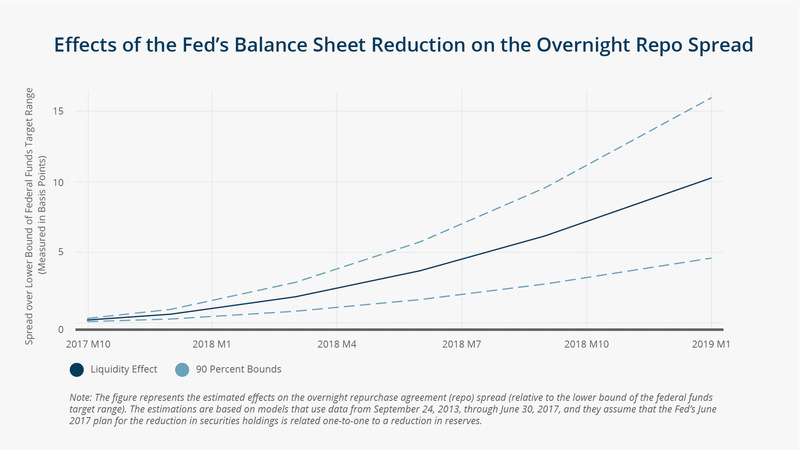 Results suggest that the impact of the Fed's balance sheet reduction on short-term interest rates will be stronger at the end of 2018 than they were a year earlier. This is in part because the reduction will gradually increase from an initial $10 billion per month in October 2017 to $50 billion per month in October 2018, but it is also because the liquidity effect will be stronger when the supply of reserve balances has already shrunk substantially. Because the Fed's overnight reverse repo (RRP) facility acts as a buffer to a drain in reserves, as reserves become relatively scarce, market participants will reduce recourse to the RRP facility and provide funding to private money markets, thereby dampening the policy-induced drain in reserves. Assuming the Fed's balance sheet reduction plan proceeds as outlined in June 2017, the built-in reduction in reserves will put upward pressure on short-term interest rates. Indeed, the balance sheet reduction and the short-term policy rate target both affect short-term rates, potentially conflicting with or reinforcing each other. Policymakers should be aware of these forces when deciding on a desired path for short-term interest rates—for both the level of rates and the timing of rate changes. Current forecasts about the future path of the short-term rate should be re-evaluated and maybe revised if they do not include the liquidity effect resulting from the balance sheet reduction. Communicating this effect may be important for a continued smooth and gradual removal of policy accommodation during this tightening cycle. Neglecting the liquidity effect in forecasts about short-term rates may also affect long-term rates through the expectations hypothesis. 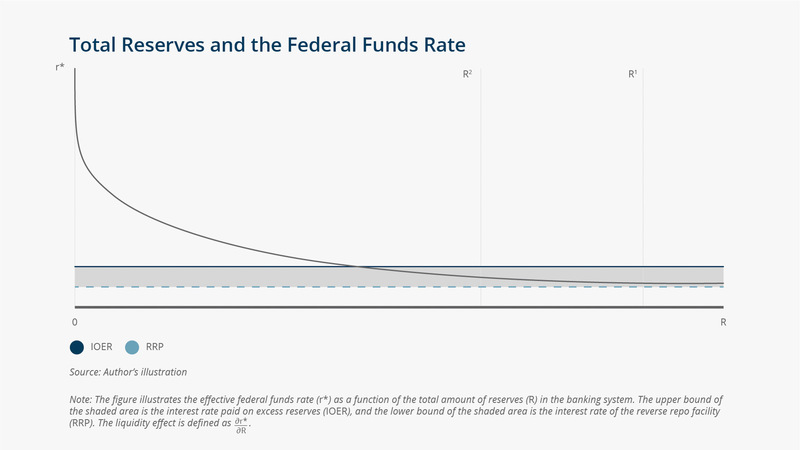 I examine the impact of the Federal Reserve's balance sheet reduction on short-term interest rates emanating from the declining supply of reserve balances. Using an exogenous shift in the supply of reserves, I estimate that by January 2019, when the Fed will have reduced its portfolio by $500 billion, the overnight repurchase agreement (repo) spread (relative to the lower bound of the federal funds target range) will be 10 basis points higher and the fed funds spread will be 2 basis points higher than in October 2017, all else being equal. I also find that a declining supply of reserve balances reduces recourse to the Fed's overnight reverse repo (RRP) facility, which might initially dampen the tightening effects on short-term rates of the Fed's balance sheet reduction.